HYDERABAD: Civil Society Support Program (CSSP), a nonprofit organisation, organised District Education Forum at HRD Thardeep Rural Development Program Hall on Sunday. CSSP shared the progress of ‘Take A Child To School‘ project with contribution of volunteer (ILM Ambassador) and Mohalla Committee. Mohalla Committees are a pillar of this initiative having potential stakeholders involved for the provision of quality and compulsory education. British Council, Children Global Network, School of Learning and FAFEN are contributing for enrollment and retention of out of school children across Sindh. CSSP Executive Director Noor Mohammad Bajeer, DEO primary Kewal Ram, Deputy Director Primary Premchand, TEO Kaloi Khangarsingh, Monitoring Assistant Harish Kumar, Monitoring Assistant Lachman, social activists, civil society organisations and other activists participated and shared their experiences with key stakeholders. DEO Primary appreciated the model of Mohalla Committees and requested to adopt policies to broaden horizons for the ‘Take A Child To School’ project. He said Mohalla Committees must look after the school and missing facilities and organise different events in their areas. Executive Director Noor Mohammad Bajeer said that CSSP will contribute for quality education via consultation with policy makers in utilisation of school specific budget, SMC funds and teachers training. 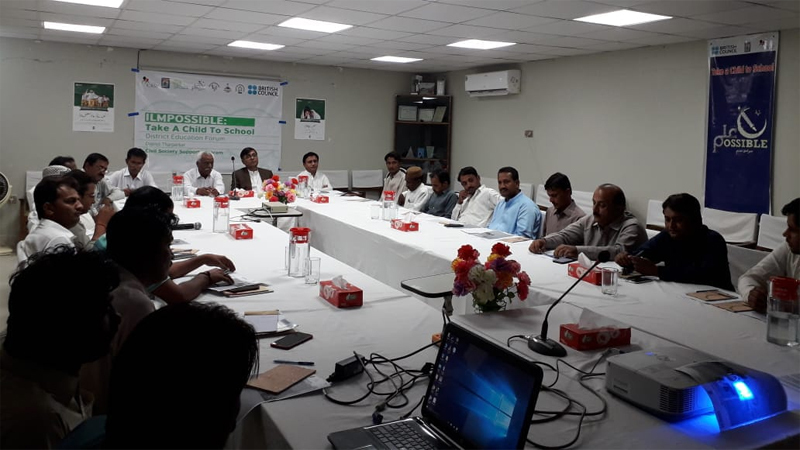 District Chairman Tharparkar Dr Ghulam Haider Samejo said one or two quality schools were enough to fulfill educational needs in the region instead of 10-15 schools with far less facilities.